MUMBAI (Scrap Register): India’s major brass and copper scrap commodities prices fell on the Scrap Register Price Index as on Thursday, tracking the weak trend in copper Futures prices at India’s Multi Commodity Exchange on worries about a global slowdown while lead touched a three-month low on concern that weak auto sales would dampen demand for car batteries. 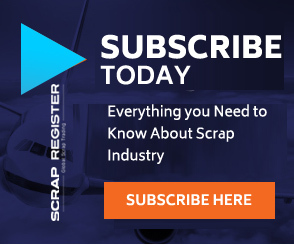 India’s major brass and copper scrap commodities prices including brass sheet cuttings, brass utensil scrap, copper heavy scrap, copper mixed scrap, copper pat, copper super d.rod, copper utensil scrap and copper wire scrap dropped on the Scrap Register Price Index as on Thursday. The most active April copper contract on India's Multi Commodity Exchange has declined by 1.36 percent to Rs. 441.60 per kilogram on Thursday from previous close of Rs. 447.70 per kilogram. Copper Futures at MCX touched an intra-day high of Rs. 446.85 per kilogram and an intra-day low of Rs. 440.85 per kilogram during Thursday. Copper fell along with other risky assets including shares after the European Central Bank on Wednesday highlighted threats to global growth and U.S. President Donald Trump threatened new tariffs on imports from the European Union. The industrial metals market was mixed, however, with some investors taking heart from data showing factory gate inflation in top metals consumer China picked up for the first time in nine months in March.